Our service is a last mile delivery service that operates via a network of hubs and a network of zero-emission transportation modes. We did a first round of desirability validation through a public survey which helped us to frame the solution. Also, we reached experts in the delivery sector in order to understand the logistics of customer-oriented efficient and timely delivery practices. In addition, these interviews helped provide us with insights around the company’s core values, key partnerships, and revenue streams which helped us better understand the logistics sector. The main stakeholders we have identified for this project are the end-recipients of an online delivery (the shopper) and the delivery companies (FedEx, UPS, DHL) that currently deliver the purchases. Another stakeholder are the local businesses that act as hubs for our service, and where points can be redeemed. Our main value proposition is that of convenience for the end-recipient of an online delivery, which are most often individuals but could also be extended to include SMEs. Our service aims to decrease the number of missed and repeated delivery attempts and thus reduce the number of kilometres driven by trucks. Our system also reduces the number of deliveries received in a day as parcels can be consolidated into a single delivery. By only offering eco-friendly delivery modes from Hub to the delivery location, Plankton seeks to aid in the reduction of unnecessary emissions. Our proposed service also has an awareness visualization built in, showing how much emissions were saved by using this service. This helps sensitize people to the issue of air pollution and emissions of greenhouse gases into the atmosphere. Our service also provides a more convenient delivery model, whereby the delivery time and location of the delivery is always left up to the customer. Another way our service benefits SMEs is through the TON Rewards which are redeemable points. By using the Plankton service, customers can accumulate points that are then redeemable for free shipping and/or at participating businesses. This could help SMEs with their overall operating costs. Logistics companies such as UPS and FedEx can save on their operational costs by having to deliver to a single location (the Plankton Hubs), instead of having to deliver to a range of individual addresses. This is the kick-off stage for the project. Here the service would incur high costs in anticipation for rolling out a fully functioning prototype. To begin the project we would need to contact potential businesses that could act as neighborhood hubs. We need to gauge their interest and negotiate individual partnerships. Not only would we reach out to businesses to act as Hubs, but we would also contact businesses that could offer incentives and promotional offers for the TON Rewards system. Lastly, we would need to contact retailers in order to promote including Plankton as a check-out delivery location option. Recruitment sessions for drivers and cyclists would be held. It is in this phase that our branding would be refined in order to communicate a strong brand image. We will build out our website to ensure that customers can sign-up for our service, and we will also build the app and develop the accompanying software. This will be a considerable expense as it is the crux of the operational capacity of our service, and one of the most complex problems to solve. In addition, many aspects of our business model will need to be finalized such as the specifics of our subscription packages. Finally, we will promote the service through a neighbourhood-level advertising campaign. In the beginning, we believe it will be a slight challenge to build momentum, and so we are proposing to target a single neighborhood hub from which to prototype our service. This smaller test run of the service will help us fine tune the details of the Plankton service, as well as gain valuable customer feedback. We may hold workshops and feedback sessions with users of the prototype service to gain an alternate perspective into our offering. From our selected neighborhood we would prepare and launch a Plankton Hub and monitor its progress. Feedback from real customers will be the top priority in this phase as we want to ensure an excellent customer experience for all involved. We hope to receive this feedback through feedback forms and through community workshops. In this phase, we will have integrated the feedback from the community participants and further streamlined our service. With this in mind, we plan to organically grow the scale and reach of the service by increasing the number of network hubs, potentially purchasing a few electric vehicles (branded with the Plankton logo) to help act as advertisement and to be able to deliver larger and heavier packages. In this phase we would reach out to grow our partnerships and depending on growth, may choose to expand into additional cities. First, a shopper places an online order. The order can be placed with a partnered retailer, or with a non-partnered retailer. When placing the order, the customer can choose to “deliver with Plankton” which will initiate a business and logistics process that will fill in the shipping location to be the nearest Plankton Hub with enough storage (assuming the customer already has an account with Plankton and has provided their home address). The regular logistics model retrieves the parcel from a fulfilment centre and delivers it to the indicated Hub. At the hub, the courier heads to the Plankton locker or hands it over to the business worker for safe-keeping. There they scan the parcel code which recognizes the end-customer. If another parcel has been received for that customer, the parcels are placed together in a single locker. The system now knows that the parcel has been received and in which locker it is placed. The automated system sends a message to the recipient of the parcel, alerting them that their parcel is ready for pick-up. The customer now has a choice to either opt for self-pick-up which is free or to arrange a delivery with a bike courier or electric vehicle (depending on weight and size). If the customer selects a delivery method, the system sends out a delivery request to a network of pre-approved couriers. Plankton has a strict zero-emission policy for its couriers. Once a courier accepts the delivery request, they are provided with the location of the Hub. Once at the hub they scan their identification tag which will then let them know which locker to open - no code is required, the system is able to verify the courier via their courier code. Once the parcel has been retrieved, the customer is notified and can monitor the delivery of their couriers’ progress (similar to ordering on UberEats). The customer greets the courier and receives the parcel(s). The payment is processed through the app when the delivery is placed. It is a variable delivery fee based on demand, timing, weight and size of the parcel. Another way Plankton is able to incur revenue is by charging the customer a late retrieval fee if they do not pick-up their parcel from the locker within 15 days. For every day the parcel is left in the locker beyond that limit, the system charges the customer a daily fee. Additional to our added value of an environmentally friendly delivery system, Plankton will have partnerships with retail shops, restaurants and local businesses to incentivise the use of the service. Every time a customer uses Plankton, a certain amount of TON Rewards will be granted to them, which will be calculated based on the delivery option they chose and the reduction of emissions associated. This way, the clients will accumulate points and will be able to redeem them in exchange for benefits in the partnerships’ stores. The benefits could include discounts, coupons, free products, or free deliveries from Plankton. When designing this service our team completed a service blueprint to better understand the various interactions between the touchpoints of the service and the customer segments. Each neighborhood would have a few local neighborhood hubs that act as pick-up and drop-off locations. Businesses could apply to become a Plankton Hub and receive a Plankton Locker which would then be set-up to the Plankton network. These lockers would be placed behind the businesses (in a back alley) or in front of the business, providing the couriers with 24-hour access to the parcels. When a business signs on to be a Plankton Hub, they receive a locker which a team will professionally install on the outside of the company. The lockers have to be accessible 24 hours a day. Through the app, customers are able to keep track of their deliveries, specify a delivery time and location, and pay for the services. Much like UberEats, the consumer is able to track the delivery of their package in real-time, pay for the services within the app, and provide feedback. We envision the same app being used for customers to request pick-up of packages for the return of items. In that case, the service operates much the same, but in reverse. The service aims to reduce urban air pollution by reducing the number of diesel vehicles needed to make last mile deliveries. We recognize that diesel vehicles will still be needed to make the deliveries to the Plankton Hubs, yet there are indications that the large logistics companies are moving towards electrifying their fleets. Another way the system aims to reduce air pollution is by reducing the number of missed and repeated delivery attempts. We have observed that delivery vehicles are often seen causing congestion due to having to double park to complete their deliveries. By transitioning the local fleet from diesel vans to bicycle couriers we aim to also liven up the streets and reduce the congestion on the roads. Finally, Plankton hopes to help visualize the problem of air quality in cities and create awareness for the customers regarding the emissions they’re indirectly producing when online shopping, by implementing the ‘TON Rewards’ system. With this, Plankton will inform the users of how many (approximate) emissions they are saving, providing some examples of the equivalent CO2 with more concrete and understandable concepts (example: using this service, you just saved the amount of CO2 that a bush would take 1 hour to convert to oxygen). We hope to promote cleaner options for everyday actions by providing this service that allows them to alter little decisions with little impact on their daily lives but great impacts on the environment. We hope that this incites a series of more sustainable choices in other aspects of their lives. One of our team members is located in Toronto. She will take the lead for this project, ensuring communication with the other team members. Where necessary, contract employees and/or studios may be hired to complete certain tasks such as branding development, web, app and software development. We intend to recruit neighborhood hubs from local businesses. They will be responsible for receiving the packages and/or licensing a space for Plankton lockers to be situated. Recruited riders and drivers will complete the deliveries. while partnering with the logistics firm in order to reduce their last mile delivery costs and at the same time cutting the emissions in the city by 45% (considering the assumptions and calculations described in the experiment) and improving the air quality. We plan to run a prototype of our service in an as-yet-to-be-determined Toronto neighborhood. For example, we are potentially looking to run the prototype around the Trinity Bellwoods area as the demographics of this neighborhood is supportive of local projects. In our first phase, the costs incurred would primarily stem from the development of the Plankton website infrastructure and operating costs for signing-up customers. Furthermore, costs would be incurred for the operational costs associated with the deliveries. These include the carry bags for cyclists and walkers, and the electric vehicles. There would also be a cost for the development of a professional brand image. We project further infrastructural costs associated with the warehouse space required to do these deliveries. We are hoping to be able to negotiate a rate with businesses in order to store a small amount of deliveries at their locations, however, we recognize that we may have to open an initial Plankton Hub from which deliveries could be picked-up or sent. Mitigation: This would be addressed by providing an initial profit margin to the store or hubs centre for keeping the parcels. Mitigation: Using MOVES software to calculate and validate with the hand calculations for managing large data sets and getting real-time data. Mitigation: Insurance to cover potential losses or damage. Mitigation: Approach the government to potentially install lockers on public property. We anticipate that our solution would quickly scale up through our integrated referral system. As the word spreads, we hope that more and more businesses and organizations can be convinced to become a Plankton hub. In the beginning, we believe it will be a slight challenge to build momentum, and so we are proposing to target a single neighborhood hub from which to prototype our service. In terms of business model, it would be a subscription model whereby subscribers would pay a fee for the last mile delivery service. This is similar to the way UberEats charges a delivery fee for the delivery of meals. We have discussed the option for a Premium subscription model as well, where subscribers could opt-in for unlimited monthly deliveries for a higher fee. In our public survey, we have found that 83% of respondents were willing to pay for such a service. Plankton will have lockers available at select locations, and any package that is left in the lockers for longer than an agreed upon time period will be charged a daily “late retrieval fee”. As shown in the preliminary pollution model design and hand calculations for emission data, a 44.6% decrease in pollutants is generated by using the Plankton model. It is important to mention that the calculations performed, even though based on empirical methods (emission factors), may be underestimating the emissions, because of one of the assumptions of not taking into account the other processes that are related to the generation of pollutants, such as fugitive emissions from the vehicle, the movement of the tires and the reaction of other components that may lead to the formation in the atmosphere of other pollutants. This study has provided a base for implementation of how consumer goods, arriving in a neighbourhood hub and delivered through our clean and environmentally-friendly service can improve air quality in an urban setting and be cost-effective at the same time. We have found that our service has benefits for a myriad of stakeholders and industries. Our solution has economic, social, and ecological benefits that together form a sustainable solution. The economic benefits are related to promoting local businesses through the community hubs and TON Rewards points. It also helps logistics companies save on delivery costs since they only have to deliver to a single location. In terms of social benefits, they are partly related to corporate social responsibility for businesses seeking to improve their ecological footprint, and to the opportunity for employees to be sourced from the local community. By having the hubs be within walking distance we are indirectly encouraging customers to opt for self-pick-up, thereby increasing their connection to their neighborhood. The ecological impact has been stated before and is mostly linked to fewer emissions. I am a designer based out of Toronto, Ontario working to improve the human experience by using a systemic and holistic approach that is characterized by a design thinking method that allows me to problem solve at a variety of scales and for a myriad of stakeholders. My background lies in industrial and graphic design and in my “spare” time I bike around in spandex with large groups of friends. 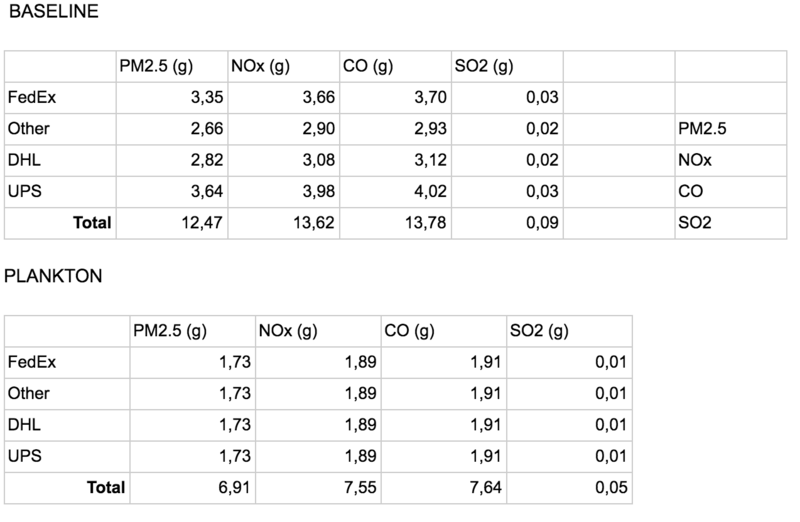 One of my contributions to the project is related to the estimation of the pollutant concentrations by describing the assumptions of the scenarios as well as the calculations of the emissions. I have a background in air quality and health, therefore the reason I am working on the calculations. In my free time, I like to walk my dog, knit and read. My interests in this project lay on the integral view of a problem and the collaboration process. My input is focused on the research of key information that will lead to a technology-based solution with a sustainability-driven approach. I like to watch movies and series on Netflix, knit (I know, the two of us?) and play board games. I am performing the calculations and designing the pollution data validation model by using TIES framework and utilizing design thinking in order to address the issues faced in urban cities globally. Since I have a mechanical background, hence I am mainly focussed on design, simulation, testing and prototyping. During my free time, I like to go hiking and discovering new places.